Vinpower is now offering our single DVD or BD external USB3.0 PC connected drive with copy protection and burning encryption software. Vinpower has offered DVD and Blu-ray video content copy protections for a number of years now through our range of manual towers and autoloaders. For the 1st time, we are offering a one off single source external DVD or BD/DVD writer drive connected to a computer by USB3.0 with the ability to perform the same DVD or Blu-ray copy protection. You no longer have to purchase a full tower when you just need a single drive to make a few copies or to add copy protection to a few burned discs. The novel idea also allows the user to add copy protection to single layer (4.7GB) DVD and (25GB) BD-R at absolutely no cost if you’re burning onto any variety of Optodisc media. 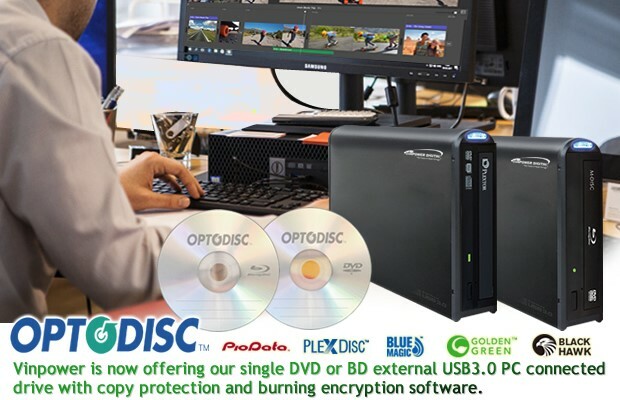 This means that you get all the benefits of our industrial copy protection features, at no cost and from anywhere you have access to a computer and the specialty external USB3.0 drive. For more details about these products or any product Vinpower carries, visit our website, www.vinpowerdigital.com, or speak with a Vinpower representative near you.